SignalR パフォーマンス カウンターは、Azure Web ロールで、アプリのパフォーマンスを監視するために使用されます。SignalR performance counters are used to monitor your app's performance in an Azure Web Role. 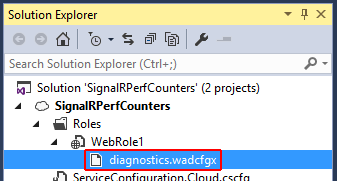 カウンターは、Microsoft Azure Diagnostics によってキャプチャされます。The counters are captured by Microsoft Azure Diagnostics. Azure で SignalR パフォーマンス カウンターをインストールするsignalr.exeを同じツールをスタンドアロンまたはオンプレミスのアプリで使用します。You install SignalR performance counters on Azure with signalr.exe, the same tool used for standalone or on-premises apps. Azure ロールでは、一時的なものであるために、アプリをインストールし、起動時に SignalR パフォーマンス カウンターの登録を構成します。Since Azure roles are transient, you configure an app to install and register SignalR performance counters upon startup. 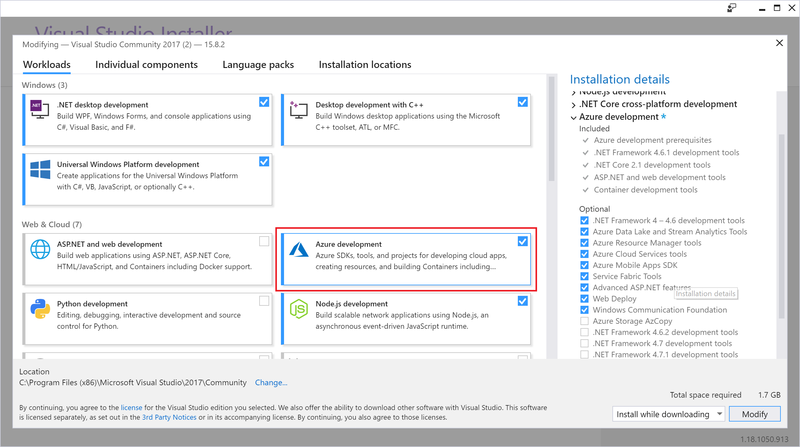 Microsoft Azure SDK for Visual Studio に注意してください。SDK をインストールした後、コンピューターを再起動します。Microsoft Azure SDK for Visual Studio Note: Restart your machine after installing the SDK. Microsoft Azure サブスクリプション:無料 Azure 試用版アカウントのサインアップを参照してください。 Azure 無料試用版します。Microsoft Azure subscription: To sign up for a free Azure trial account, see Azure Free Trial. Visual Studio を開きます。Open Visual Studio. 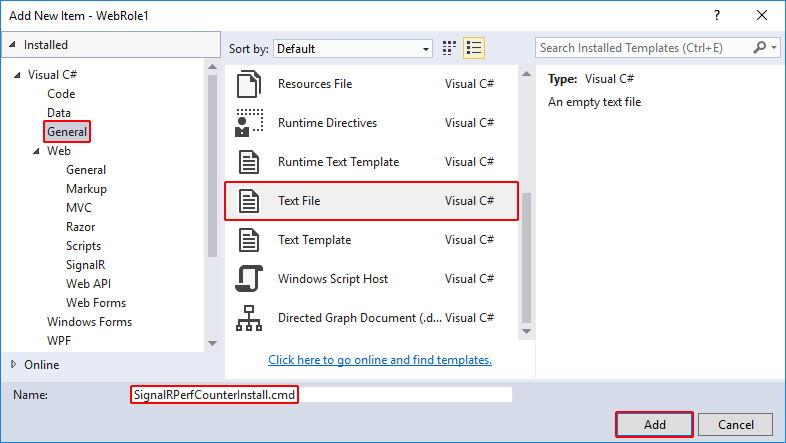 Visual Studio で、[ファイル] > [新規作成] > [プロジェクト] の順に選択します。In Visual Studio, select File > New > Project. 新しいプロジェクトダイアログ ボックスで、 Visual c# > クラウド、左側のカテゴリを選び、 Azure クラウド サービステンプレート。In the New Project dialog box, select the Visual C# > Cloud category on the left, and then select the Azure Cloud Service template. アプリの名前を付けますSignalRPerfCounters選択 [ok] します。Name the app SignalRPerfCounters and select OK.
表示されない場合、クラウドテンプレートのカテゴリまたはAzure クラウド サービステンプレートをインストールする必要があります、 Azure 開発for Visual Studio 2017 のワークロード。If you don't see the Cloud template category or the Azure Cloud Service template, you need to install the Azure development workload for Visual Studio 2017. 選択、 Visual Studio インストーラーを開くの左下にあるリンク、新しいプロジェクトダイアログが Visual Studio インストーラーを開きます。Choose the Open Visual Studio Installer link on the bottom-left side of the New Project dialog to open Visual Studio Installer. 選択、 Azure 開発ワークロードを選び、変更ワークロードのインストールを開始します。Select the Azure development workload, and then choose Modify to start installing the workload. 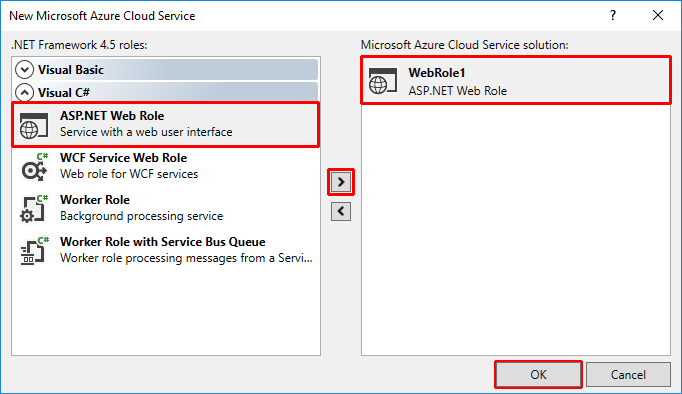 新しい Microsoft Azure クラウド サービスダイアログ ボックスで、 ASP.NET Web ロールを選択し、>、ロールをプロジェクトに追加するボタンをクリックします。In the New Microsoft Azure Cloud Service dialog, select ASP.NET Web Role and select the > button to add the role to the project. [OK] を選択します。Select OK.
新しい ASP.NET Web アプリケーション - WebRole1ダイアログ ボックスで、 MVCテンプレート、および選択しOK。In the New ASP.NET Web Application - WebRole1 dialog, select the MVC template, and then select OK.
ソリューション エクスプ ローラー、オープン、 diagnostics.wadcfgxファイルWebRole1します。In Solution Explorer, open the diagnostics.wadcfgx file under WebRole1. 起動時やがリサイクルされるときに、ロール インスタンスに SignalR パフォーマンス カウンターをインストールするアプリを構成します。Configure the app to install the SignalR performance counters into the role instance when it starts up or recycles. ソリューション エクスプ ローラーを右クリックし、 WebRole1順に選択して追加 > 新しいフォルダーします。In Solution Explorer, right-click on the WebRole1 project and select Add > New Folder. 新しいフォルダーの名前スタートアップします。Name the new folder Startup. 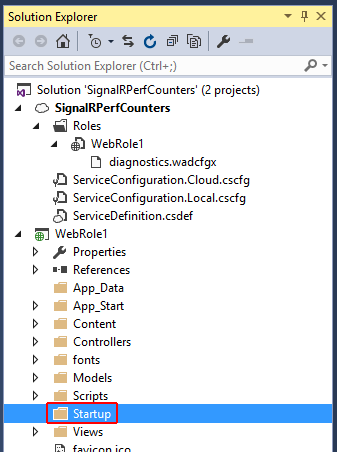 コピー、 signalr.exeファイル (を使用して追加、 Microsoft.AspNet.SignalR.Utilsパッケージ) から<プロジェクト フォルダー >/SignalRPerfCounters/packages/Microsoft.AspNet.SignalR.Utils< 。バージョン >/するツール、スタートアップ前の手順で作成したフォルダーです。Copy the signalr.exe file (added with the Microsoft.AspNet.SignalR.Utils package) from <project folder>/SignalRPerfCounters/packages/Microsoft.AspNet.SignalR.Utils.<version>/tools to the Startup folder you created in the previous step. ソリューション エクスプ ローラーを右クリックし、スタートアップフォルダーと選択追加 > 既存項目のします。In Solution Explorer, right-click the Startup folder and select Add > Existing Item. 表示されるダイアログ ボックスで、次のように選択します。 signalr.exe選択追加します。In the dialog that appears, select signalr.exe and select Add. 右クリックし、スタートアップフォルダーを作成します。Right-click on the Startup folder you created. [追加] > [新しい項目] の順に選択します。Select Add > New Item. 選択、全般ノードを選択テキスト ファイル、新しい項目の名前とSignalRPerfCounterInstall.cmdします。Select the General node, select Text File, and name the new item SignalRPerfCounterInstall.cmd. このコマンド ファイルは、SignalR パフォーマンス カウンターを web ロールにインストールされます。This command file will install the SignalR performance counters into the web role. 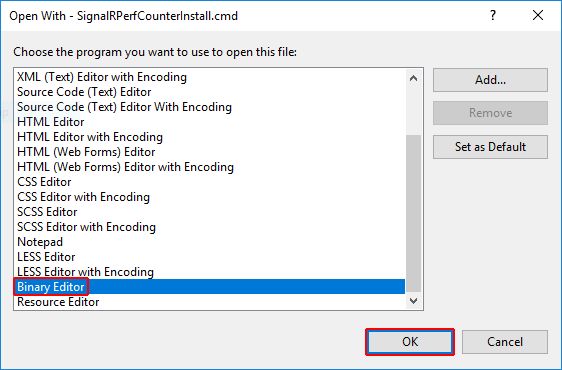 Visual Studio で作成すると、 SignalRPerfCounterInstall.cmdファイルが自動的に開きますのメイン ウィンドウにします。When Visual Studio creates the SignalRPerfCounterInstall.cmd file, it will automatically open in the main window. 次のスクリプトを使用して、ファイルの内容を交換し、保存して、ファイルを閉じます。Replace the contents of the file with the following script, then save and close the file. このスクリプトが実行されるsignalr.exe、ロール インスタンスに SignalR パフォーマンス カウンターを追加します。This script executes signalr.exe, which adds the SignalR performance counters to the role instance. 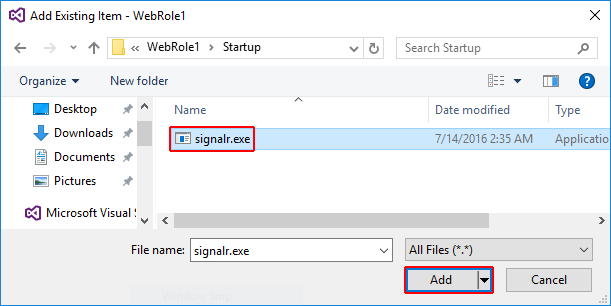 選択、 signalr.exeファイルソリューション エクスプ ローラーします。Select the signalr.exe file in Solution Explorer. ファイルのプロパティ設定出力ディレクトリにコピーに常にコピーします。In the file's Properties, set Copy to Output Directory to Copy Always. 前の手順を繰り返して、 SignalRPerfCounterInstall.cmdファイル。Repeat the previous step for the SignalRPerfCounterInstall.cmd file. 右クリックし、 SignalRPerfCounterInstall.cmdファイルおよび選択プログラムから開くします。Right-click on the SignalRPerfCounterInstall.cmd file and select Open With. 表示されるダイアログ ボックスで、次のように選択します。バイナリ エディター選択とOKします。In the dialog that appears, select Binary Editor and select OK.
バイナリ エディターでは、ファイルの先頭バイトを選択し、削除します。In the binary editor, select any leading bytes in the file and delete them. ファイルを保存して閉じます。Save and close the file. 開いているViews/Shared/_Layout.cshtmlと jQuery のバンドルのスクリプト ファイルの末尾から削除します。Open Views/Shared/_Layout.cshtml and remove the jQuery bundle script from the end of the file. 新しいフォルダーを作成、 WebRole1という名前のプロジェクトHubsします。Create a new folder in the WebRole1 project named Hubs. 右クリックし、 Hubsフォルダーソリューション エクスプ ローラー選択と追加 > 新しい項目の。Right-click the Hubs folder in Solution Explorer and select Add > New Item. 新しい項目の追加ダイアログ ボックスで、 Web > SignalRカテゴリ、および選択し、 SignalR ハブ クラス (v2) 項目テンプレート。In the Add New Item dialog box, select the Web > SignalR category, and then select the SignalR Hub Class (v2) item template. 新しいハブの名前を付けますMyHub.cs選択追加します。Name the new hub MyHub.cs and select Add. Crank.exe 接続密度テスト SignalR コードベースで提供されるツールです。Crank.exe is a connection density testing tool provided with the SignalR codebase. Crank は、永続的な接続を必要とするために追加するサイトを使用してテストするときにします。Since Crank requires a persistent connection, you add one to your site for use when testing. 新しいフォルダーを追加、 WebRole1という名前のプロジェクトPersistentConnectionsします。Add a new folder to the WebRole1 project called PersistentConnections. このフォルダーを右クリックして追加 > クラスします。Right-click this folder and select Add > Class. 新しいクラス ファイルに名前MyPersistentConnections.cs選択追加します。Name the new class file MyPersistentConnections.cs and select Add. 上記のコードで、OwinStartup属性は OWIN を開始するには、このクラスをマークします。In the code above, the OwinStartup attribute marks this class to start OWIN. Configurationメソッドは、SignalR を開始します。The Configuration method starts SignalR. 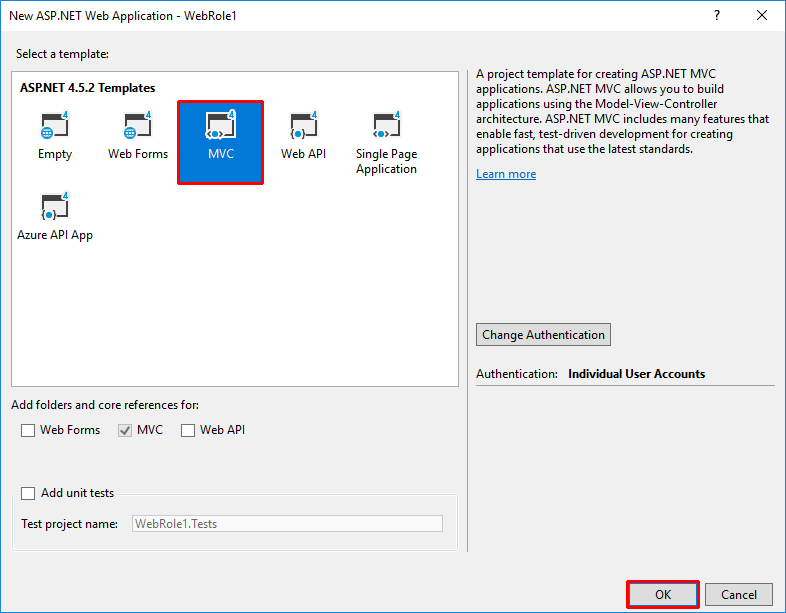 Microsoft Azure エミュレーターでキーを押してアプリケーションをテストF5します。Test your application in the Microsoft Azure Emulator by pressing F5. 約 1 分間待機します。Wait about one minute. 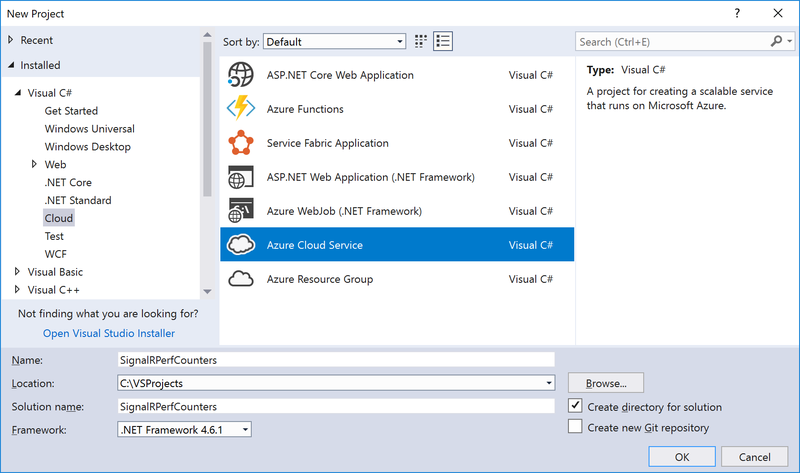 Visual Studio で Cloud Explorer ツール ウィンドウを開きます (ビュー > Cloud Explorer) パスを展開および(Local)/Storage Accounts/(Development)/Tablesします。Open the Cloud Explorer tool window in Visual Studio (View > Cloud Explorer) and expand the path (Local)/Storage Accounts/(Development)/Tables. 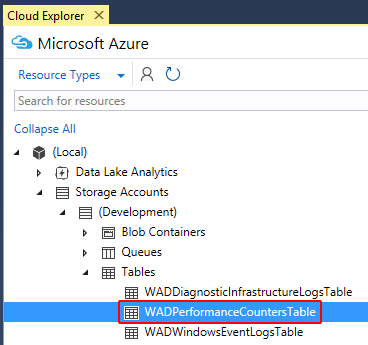 ダブルクリックWADPerformanceCountersTableします。Double-click WADPerformanceCountersTable. 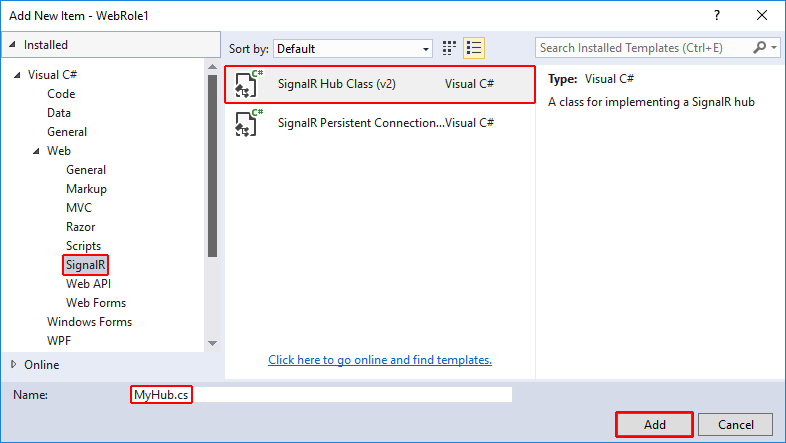 テーブルのデータで SignalR カウンターが表示されます。You should see SignalR counters in the table data. テーブルが表示されない場合は、Azure ストレージの資格情報を再入力する必要があります。If you don't see the table, you may need to re-enter your Azure Storage credentials. 選択する必要があります、更新ボタンをクリックして、テーブルでCloud Explorerまたは選択、更新テーブル内のデータを表示するテーブルを開くウィンドウのボタン。You may need to select the Refresh button to see the table in Cloud Explorer or select the Refresh button in the open table window to see data in the table. クラウドでアプリケーションをテストするには、更新、 ServiceConfiguration.Cloud.cscfgファイルし、設定、Microsoft.WindowsAzure.Plugins.Diagnostics.ConnectionString有効な Azure Storage アカウント接続文字列にします。To test your application in the cloud, update the ServiceConfiguration.Cloud.cscfg file and set the Microsoft.WindowsAzure.Plugins.Diagnostics.ConnectionString to a valid Azure Storage account connection string. Azure サブスクリプションにアプリケーションを展開します。Deploy the application to your Azure subscription. アプリケーションを Azure にデプロイする方法の詳細については、を作成して、クラウド サービスをデプロイする方法を参照してください。For details on how to deploy an application to Azure, see How to Create and Deploy a Cloud Service. 数分待ってから。Wait a few minutes. Cloud Explorer先ほど構成したストレージ アカウントを見つけて、検索、WADPerformanceCountersTable内のテーブル。In Cloud Explorer, locate the storage account you configured above and find the WADPerformanceCountersTable table in it. テーブルのデータで SignalR カウンターが表示されます。You should see SignalR counters in the table data. テーブルが表示されない場合は、Azure ストレージの資格情報を再入力する必要があります。If you don't see the table, you may need to re-enter your Azure Storage credentials. 選択する必要があります、更新ボタンをクリックして、テーブルでCloud Explorerまたは選択、更新テーブル内のデータを表示するテーブルを開くウィンドウのボタン。You may need to select the Refresh button to see the table in Cloud Explorer or select the Refresh button in the open table window to see data in the table. 感謝します。 特別なMartin Richardの元のコンテンツをこのチュートリアルで使用します。Special thanks to Martin Richard for the original content used in this tutorial.